Understanding the data collection needs of forestry professionals is at our core. In fact, timber cruising and forest inventory applications in the Pacific Northwest United States were among the first of Juniper Systems customers. With over 25 years focused on arming professionals with quality rugged data collection devices, Juniper is trusted worldwide as a company that provides users with impressive products and results. We’re proud to include the Geode Sub-meter GPS Receiver in this group. Creating a premiere GPS receiver that won’t wimp out under dense tree canopy required extensive research and testing, and that’s just what we did. As a team, we’re excited to share the results of our latest tests to better illustrate the impressive accuracy the Geode GPS Receiver is known for. To get an accurate representation of how our Geode Real-time Sub-meter GPS Receiver performs under dense tree canopy, we sought out accuracy tests in two of the most challenging GPS environments available. First, the Geode GPS Receiver was tested at the official United States Forest Service (USFS) Dense Tree Canopy Test Course in Powell, Idaho. This is an old-growth cedar forest located in a deep canyon near the Montana border. 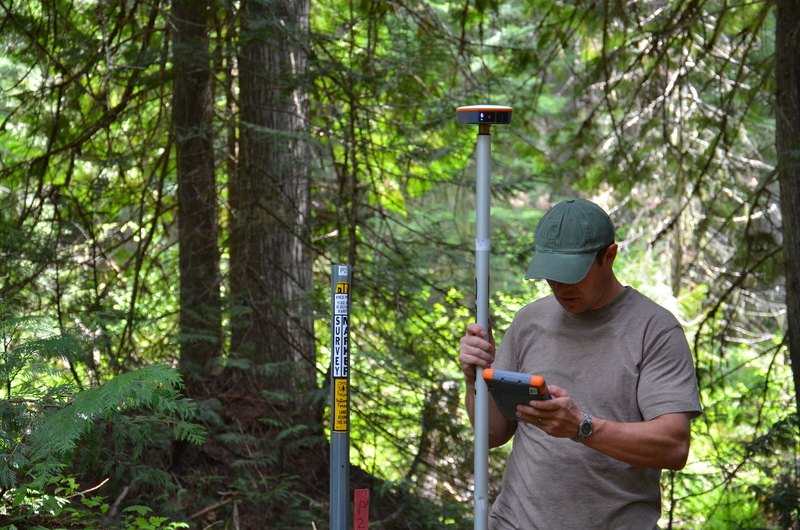 Second, the Geode GPS Receiver was tested at the University of British Columbia’s Malcolm Knapp Research Forest. This course, a mixed conifer stand with extremely dense canopy, is located on the side of a coastal mountain. These two courses were selected because of the terrible environment they create for GPS, allowing us to experience an accurate representation of the conditions forestry professionals work in regularly. Under the guidance of the USFS Missoula Technology Development Center, our tests followed the methodology and standards defined by the National Standard for Spatial Data Accuracy (NSSDA). Both test courses consisted of at least 10 professionally surveyed points placed deliberately under the heaviest tree canopy. With the Geode GPS Receiver mounted on a pole, our research specialist walked the course three separate times collecting positions at 1, 5, and 60 second intervals, for a total of 30 captured positions. After the test, all data was recorded into the official US Forest Service accuracy templates for comparison against the surveyed positions. *The results of these tests are presented without post-processing at 2DRMS 95% confidence. We’re extremely proud of the accuracy the Geode GPS Receiver consistently achieves. Blowing away the competition, the result of 2.66 meters at 60 seconds was one of the best results of any precision GPS receiver tested at the USFS Powell, ID research center. Our results were later post-processed for comparison and the results remained surprisingly similar. After these tests, we can confidently say we have successfully created the best-in-class GPS receiver for data collection under dense tree canopy cover. The accuracy users achieve with the Geode GPS Receiver can be attributed to its well-organized design. From extensive antenna testing to the placement of the antenna and electronics within the device, the Geode GPS Receiver was designed for accuracy. Since its release, foresters have been raving over it for a number of reasons. Its completely wireless, user-friendly design allows users to walk through thick forest to capture accurate data, without having to worry about the accuracy of the data they’re collecting. In addition to its outstanding accuracy, the Geode GPS Receiver is also built ultra-rugged (waterproof, dustproof, and drop proof – IP68/Mil-STD-810G) and remains the lowest priced high-accuracy receiver of its kind on the market today. To learn more about the Geode Sub-Meter GPS Receiver, visit our web page at http://www.junipersys.com/Juniper-Systems-Rugged-Handheld-Computers/products/Geode-Sub-Meter-GPS-Receiver or drop a comment or question below. Please, if you are very kind to contact the sales department.